Do you know what doesn't help her deal with those sorts of problems? Beast Boy shouting in her ear about tofu. Or Cyborg playing loud video games all afternoon. Or Starfire blathering on about one of the many incomprehensible traditions from Tamaran. Or Robin and his constant need to train with Birdarangs every hour of the day. All that would be enough to drive any girl crazy! So, we get it. Rave, if you need to spend some time meditating to keep your calm, then go right ahead. If you want to skip a night out to read your book, you go ahead and do you girl! Do you get Raven? 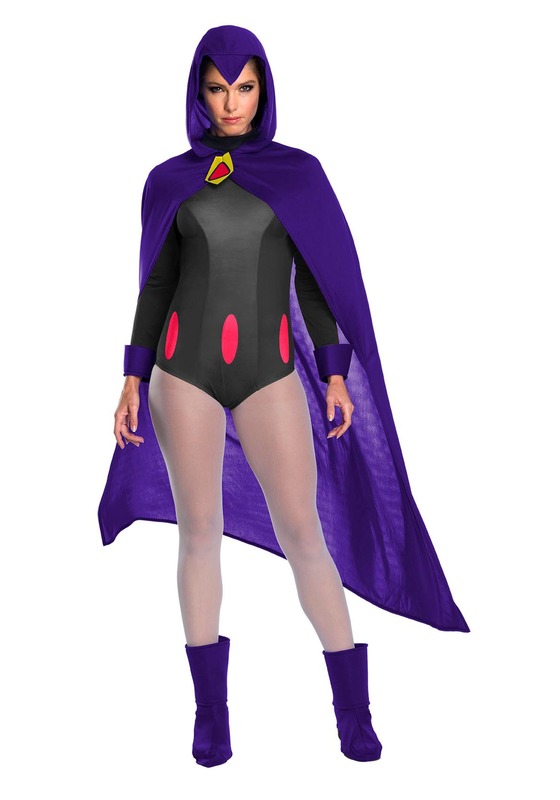 Then maybe it's time for you to assume the role of your favorite Teen Titan with this women's Raven costume! This costume is officially licensed from the animated series and it comes with a black, long-sleeved bodysuit with red accents around the waist. It also comes with the dark purple cape with hood. After all, you can't be Raven without her signature hood! Finally, the purple boot covers help you put the finishing touch on your Teen Tian cosplay outfit. With this Raven costume on, you might start feeling like a real superhero! Just remember that it takes years of training to learn some of the magic techniques that Raven uses, so don't go starting a fight with Slade until you've spent some time mastering your chants. Azarath Metrion Zinthos!